This disc includes a show preview by bodybuilding legend Vince Taylor and journalist Dave Bontempo, the Opening Ceremony, the complete posing routines of all 15 athletes – plus a presentation from the host and the triumphant Awards Ceremonies. 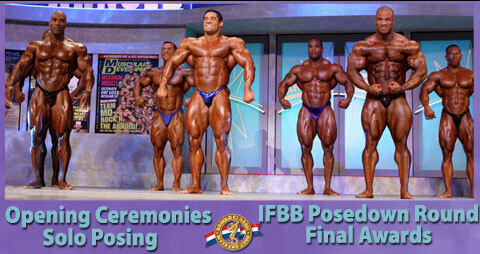 Don’t miss the creative posing by such stars as Melvin Anthony, Branch Warren, and Lee Priest – not to mention the flawless, razor-sharp and elegant physique of two-time champion Dexter Jackson. This new DVD is rich with color, information, action, and suspense. See PHOTO and REPORT below. Now only sold as a 2 DVD SET, A1132DVD.